Archibald Ramsay and his wife Christina emigrated from a tenant farm near Campbeltown in the Kintyre Peninsula, Scotland with their son Alexander and several of their children to join their son Norman in Puslinch. Archibald was a man of massive build – six feet, five inches in height – and at his death at age eighty-nine had a mass of almost black curly hair. He died in 1858. Christina, nee McLean, predeceased Archibald by a year. They had a family of 14 – 5 boys and 9 girls. 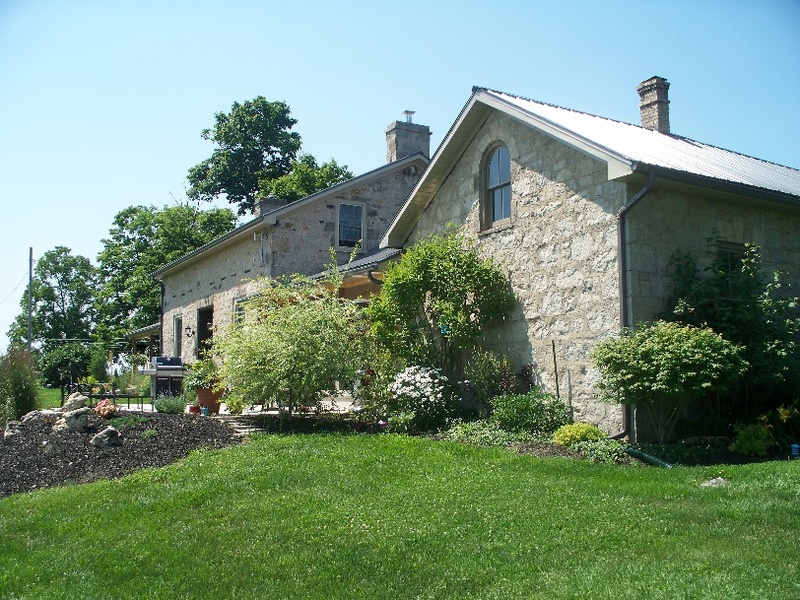 Besides their sons Alexander and Norman in Puslinch, their daughters who survived to adulthood also settled here. Ellen married Dougald McLarty (Lot 8, R. Gore), Christina married John McAllister (Lot 6, R. 1) and after his death Thomas Heritage, Barbara married James Smith Hogg (Lots 18-20, R. 1), Charlotte married Andrew Gibson (Lot 12, F. 1) and Jane ("Jean") married Matthew McPhatter Sr. (Lot 14, F.1). All of their farms are recorded on the 1861 map of Puslinch Township. Norman Ramsay left Scotland with his older brothers Donald and Archie, who died of cholera before arriving in Puslinch – Donald at Quebec in 1832, and Archie at Hamilton in 1834. We can only imagine Norman's anguish. He located on lot 7, rear Gore. Their brother Alexander remained behind to work among the Kintyre farmers until he had earned enough money to pay for the passage to Canada for their father, mother, three of their sisters and himself. They joined Norman here in 1842. Alexander purchased the south half of lot 7 and named his Puslinch farm ‘Dalhousie' after that branch of their Ramsay family. (They were related to the Ramsay who became Governor-General of Nova Scotia and founded Dalhousie University.) Alexander often described those early years recounting that his only food while cutting down the heavy timbers was oatmeal cake, which his mother Christina baked and which he carried with him, buried under the snow and when hungry, ate beside a fired stump. After the death of his parents in the 1850s, Alexander felt free to marry. Up to that time he felt it was his duty to care for his parents and his sisters. He met and married Jane Pursell, who with her mother and sister Mary, had come to Canada in 1852 from Scotland. Her sister-in-law Barbara had married James Smith Hogg of Ettrick, Selkirk, Scotland connecting the Puslinch Hogg family to James Hogg, the Ettrick Shepherd – one of Scotland's best loved poets. Norman Ramsay died in the snow returning from Galt in 1854. It was several days before his body was found. After his death, the sisters and their husbands took legal action for a division of his property and won; this, in spite of the fact that Alexander had worked for them, brought them here and given them their keep until they were married. Ellen, the eldest, set up her son Donald McLarty on his uncle's farm. Later in life Alexander's son James heard Andrew Gibson, Charlotte's husband, plead with Alexander for forgiveness for the wrong that they and he had done – a forgiveness that Alexander, in his nobility, granted. It turned out tragedy struck Alexander Ramsay's family as well, when he lost his sight from cataracts as a young father. His sons Archie and James were thrust into the roles of men at the ages of 13 and 9, by their father's blindness. The family rented their farm to William McIntyre, a neighbour in 1869. He didn't pay the rent for 1870, so they took back the farm and Archie and James took charge entering into poverty, hard work, and hardships for many succeeding years. In the 1860s, the great Civil War to the south brought about a very dangerous situation between the United States and Great Britain, hence the need for a union of the scattered British colonies. This led to the British North America Act, the 150th anniversary of which we are celebrating in Canada this year (2017). Alexander and Jane's son James D. Ramsay recalled the homecoming of some of their relatives in 1865 from the American Civil War, as they told of the names of Lincoln, Lee, Grant and McLellan which he heard as he sat on his father's knee and looked with wonder at these men who had fought, were wounded and had spent many months in prisons. His uncle Thomas Heritage was one. War seemed glorious then, but later the thought of it became abhorrent to him. James also recalled the poor and needy, who were always fed and warmed by his mother. He wondered at all she accomplished, and all without a murmur or complaint. Through the 1870s, he and Archie battled for more than ten years to pay off the farm mortgage and to feed, clothe and send the younger members of the family to school, a heavy task for two teens. James was only able to attend school sporadically and recalled there were days when he felt he must break and give in, but never did. In 1879 the Credit Valley Railway, now the CPR, was graded across their farm. They didn't get a cent, however, as payment went to the man who held the mortgage. This made them so angry that they paid off the mortgage in the next two years. In 1885 James, now aged 24, entered the Galt Collegiate and in six months succeeded in passing the third-class examinations, which, with three months at model school at Galt, qualified him to teach for three years. 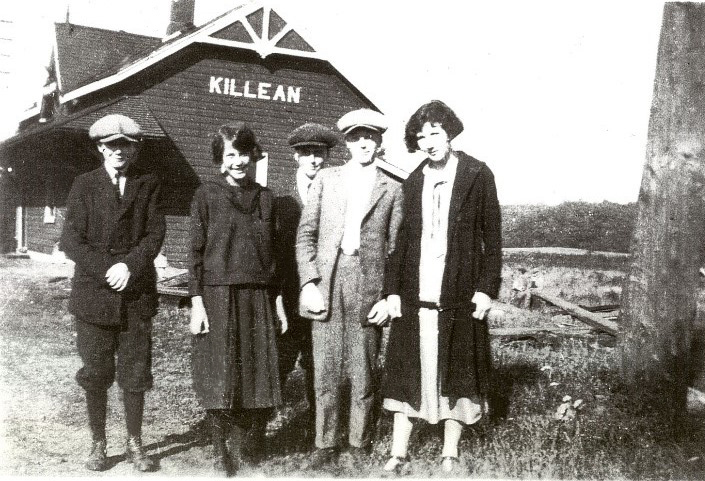 He felt honoured when asked by the trustees of S.S. # 7, Puslinch, to become the teacher at the Killean School which he had so irregularly attended. This led to a lifelong teaching career, ending with him as the principal of Hespeler Public School. Collection of Betty Ferguson, P.H.S.